Tim Cox is a real cowboy and one of today's most collected painters of the iconic West. 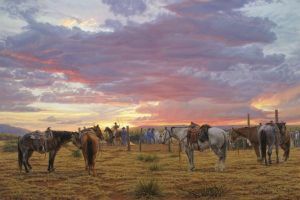 The sun sets behind a mass of purple and blue clouds as several cowhands go about their work on the open range. As their horses graze around the corral, a couple of cowhands herd the cattle and others brand the livestock. The cowboy is all too familiar with long days and short pay, but is rewarded with a life of freedom and looking forward to what the next day may bring.